Trump now is zeroing in on — and at times embellishing — reports that a longtime U.S. government informant approached members of his 2016 campaign during the presidential election in a possible bid to glean intelligence on Russian efforts to sway the election. 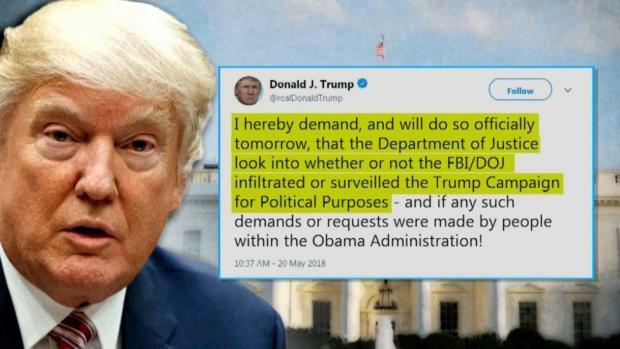 He tweeted Wednesday morning that the FBI has been caught in a "major SPY scandal." Trump's latest broadsides set the stage for an unusual decision by the White House to arrange a briefing about classified documents for just two Republican House members, both Trump allies, in a meeting Thursday, as Trump and his supporters in Congress press for information on the outside informant. After Democratic complaints and negotiations that went into the late evening Wednesday, the White House said it would also give a second briefing to a group of lawmakers known as the "Gang of Eight" immediately after the briefing for the two House Republicans. The "Gang of Eight" includes the top Republicans and Democrats in each chamber and the top Republicans and Democrats on the House and Senate intelligence committees. According to the Justice Department, White House Chief of Staff John Kelly and Deputy Attorney General Rod Rosenstein were also added to the roster after not being included on the original list. The White House has arranged a briefing between intelligence officials and two top Republicans to look at classified documents about a confidential FBI informant who made contact with the Trump campaign. No Democrats were invited, and the White House is defending the decision to exclude them. It remains unclear what, if any, spying was done. The White House has given no evidence to support Trump's claim that the Obama administration was trying to spy on his 2016 campaign for political reasons. 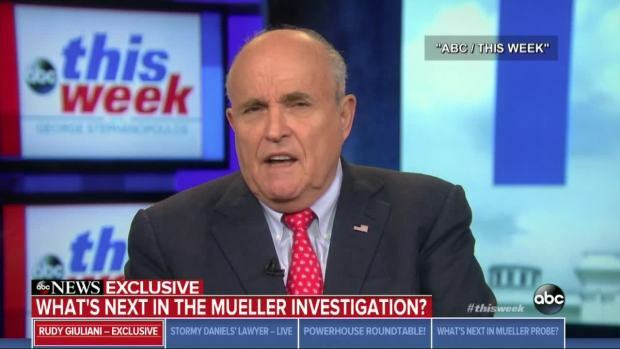 It's long been known that the FBI was looking into Russian meddling during the campaign and that part of that inquiry touched on the Trump campaign's contacts with Russian figures. Trump has told confidants in recent days that the revelation of an informant was potential evidence that the upper echelon of federal law enforcement has conspired against him, according to three people familiar with his recent conversations but not authorized to discuss them publicly. Trump told one ally this week that he wanted "to brand" the informant a "spy," believing the more nefarious term would resonate more in the media and with the public. He went on to debut the term "Spygate" on Wednesday, despite its previous associations with a 2007 NFL scandal over videotaping coaches. Democrats said Wednesday that the briefing — held as special counsel Robert Mueller investigates Trump's campaign and whether it was involved in Russian meddling in the U.S. election — was highly inappropriate and asked for the "Gang of Eight" briefing instead of Thursday's GOP-only meeting. After negotiations with leaders on Capitol Hill, the White House announced the additional bipartisan meeting but said the original briefing would go on as well. The two House lawmakers — Intelligence Committee Chairman Devin Nunes and Oversight and Government Reform Chairman Trey Gowdy — will attend both briefings, as will Kelly, Rosenstein, FBI Director Christopher Wray and National Intelligence Director Dan Coats. The second meeting will include all of those people plus Senate Majority Leader Mitch McConnell, Senate Democratic Leader Chuck Schumer, House Speaker Paul Ryan and House Democratic Leader Nancy Pelosi. Senate Intelligence Committee Chairman Richard Burr will also attend, along with the top Democrat on the Senate intelligence panel, Sen. Mark Warner, and the top Democrat on the House intelligence panel, Rep. Adam Schiff. Nunes, an ardent Trump supporter, originally demanded the information on an FBI source in the Russia investigation. And Trump took up the cause as the White House tries to combat the threat posed by Mueller's investigation. 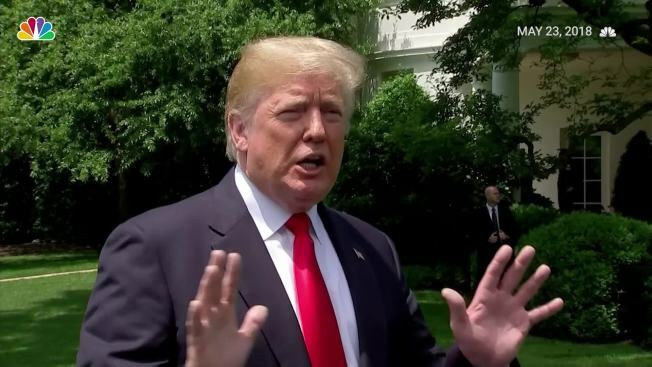 Trump escalated his efforts to discredit that investigation Wednesday, tweeting: "Look how things have turned around on the Criminal Deep State. They go after Phony Collusion with Russia, a made up Scam, and end up getting caught in a major SPY scandal the likes of which this country may never have seen before! What goes around, comes around!" Former FBI Director James Comey, who was fired by Trump last year, tweeted Wednesday morning that the agency's use of secret informants was "tightly regulated and essential to protecting the country." "Attacks on the FBI and lying about its work will do lasting damage to our country," he said. "How will Republicans explain this to their grandchildren? Trump told reporters in response: "What I'm doing is a service to this country and I did a great service to this country by firing James Comey." The back and forth between Congress and the Justice Department over the Nunes request — one of many over the course of the Russia investigation — has been simmering for weeks. Separately on Wednesday, Mueller's prosecutors asked a federal judge to start the process of sentencing former Trump campaign adviser George Papadopoulos, who has been a key witness in the investigation since his plea last year to lying to the FBI. Prosecutors had been pushing off Papadopoulos' sentencing for months as he cooperated in the probe. Information about Papadopoulos' contact with people linked to Russia during the 2016 campaign triggered the FBI counterintelligence investigation that Mueller took over. Associated Press writers Anne Flaherty, Chad Day, Desmond Butler, Jill Colvin, Eric Tucker and Darlene Superville contributed to this report.